Faculty praised each of the previous six editions of Howard Abadinsky's clear, comprehensive overview of the US legal system. 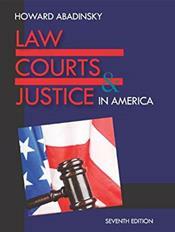 His latest edition Law, Courts, and Justice in America (previously Law and Justice) represents a refined, updated synthesis of the complex, fluid justice system in the United States. Part I (Law) describes the history of the US justice system and the emergence of law schools; the realities of a law school education; and the current state of the legal profession for both women and men. Part II (Courts) unravels the structure of federal and state court systems, delineating differences between constitutional and legislative courts and between trial and appellate courts; the structure and purpose of appellate courts; and the Supreme Court, noting variations in the interpretation of statutes, the Constitution, and the original intent of legislators; and the roles of judges, prosecutors, and attorneys. Part III (Justice) demystifies the criminal, civil, and juvenile judicial processes; plea-bargaining and the controversies surrounding it; and adjudication options outside of traditional, adversarial legal venues. Throughout, landmark cases, important historical events, illustrative examples, and boxed items highlight or expand chapter content.